This is a fabulous side dish for a weeknight meal. It’s fast, from prep to the table is less than 15 minutes. It’s full of flavor with the garlic and ginger. The Thai curry paste adds a depth of flavor and a little kick. The Haricot Verts give that nice little crunch of texture in addition to their beautiful flavor. This is another eggplant dish except instead of the Aubergine eggplant this uses the long, thin skinned Japanese eggplant that you don’t need to peel. Just slice these pretty beauties and stir fry. Not difficult at all. It’s perfect after a long day at work and you want a quick meal. We serve this with seared tuna and the total prep and cooking time for the whole meal is less than 30 minutes. So when you have had a long day at work and don’t feel like cooking but you know you must, keep this recipe handy. Even if you’re not tired or pressed for time, you will thoroughly enjoy this recipe. Heat oil in wok or heavy large skillet over high heat until hot. Add eggplant strips and toss to coat with oil. Stir-fry until eggplant strips begin to brown, about 2 minutes. 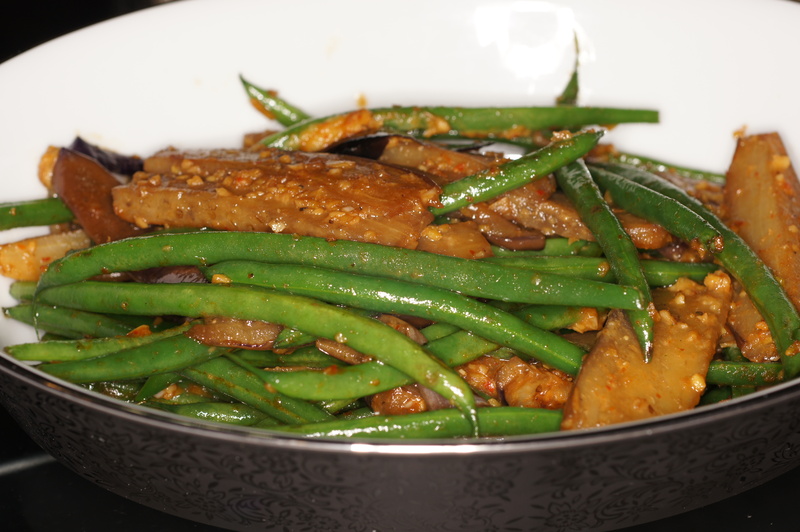 Add haricots verts and stir-fry until eggplant strips are tender and haricots verts are crisp-tender, about 1 minute. Add garlic and ginger and stir-fry 10 seconds. Add miso mixture, soy sauce and curry paste and stir until liquids thicken, about 30 seconds. Transfer to bowl and serve. Thanks for dropping by and your nice comment. We really like this dish but what makes it over-the-top is the homemade Red Thai Curry Paste. It adds such nice subtle nuances you cannot find in store bought paste. I need to try it hibachi-style. Thanks for the suggestion.